Organic seed growers should develop a multiple-tactic systems approach to weed management that results in fewer weed seeds in the soil and fewer opportunities for their germination, growth, and seed production. Below are listed the steps involved in a systems approach to weed control; this list is taken from the eOrganic article Twelve Steps Toward Ecological Weed Management in Organic Vegetables, authored by Mark Schonbeck. For comprehensive information on how to design a systems weed management plan for your farm, read the more in-depth articles on each weed management step that are linked from the title of the step. Put the weeds out of work – grow cover crops! Weed seed contamination in harvested seed is a problem that affects seed quality and marketabilty. The first steps in avoiding weed seed contamination are 1) managing weeds in the field, and 2) avoiding weed seed contamination during the harvesting process. Once harvested, crop seed is contaminated by weed seed, which must be removed in the seed cleaning process. Weed seed mixed in with the harvested seed is difficult to remove, particularly if the weed seed is of a similar size, weight, shape or color as the crop seed. If the seed is even a slightly different size or weight, it may be removed with standard seed cleaning practices such as screening or fanning. Some similar-sized crop seed may be lost in the process. The related eOrganic publication Organic Seed Processing: Threshing, Cleaning, and Storage provides information on seed cleaning practices such as screening and winnowing useful in removing weed seed. Seed of some weed species is regulated by state governments and classified as noxious or prohibited. Seed for sale in quantities over one pound must be tested for purity and labeled accordingly. Seed sold in quantities lower than one pound must follow the same regulations, but labeling is not required. 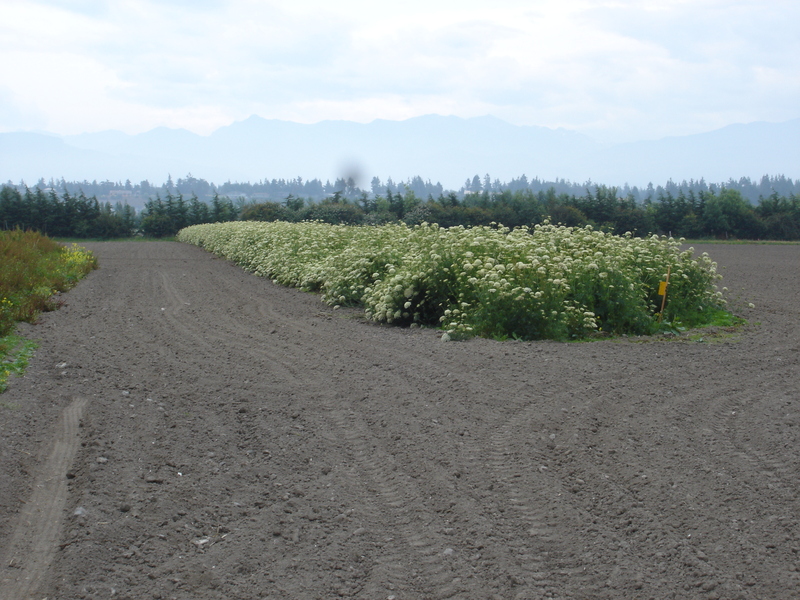 Purity tests measure the amount of inert material in the seed crop, the level of noxious weed seeds, and the presence of prohibited weed seed. Seed lots that contain a restricted weed seed count above a specified count per volume cannot be legally sold; prohibited weed seeds have a zero tolerance. Find and read your state's seed regulations, as these regulations vary by species and by state. In organic production, weed seed contamination can be even more detrimental as organic producers have fewer weed control options than conventional growers. The eOrganic resources linked below are useful for the identification and management of weed seeds in seed crops and for general organic weed managment practices. Noxious or prohibited weed seed. Similar size and/or weight as crop seed. Focus efforts on weed management and contamination prevention. Unmarketable seed or significant yield loss in cleaning process. Not noxious or prohibited weed seed. Similar size and/or weight as crop seed. Focus efforts on weed management and contamination prevention. Marketable, but lower quality seed crop if contaminated with weed seed. Noxious or prohibited weed seed. Distinctly different size and/or weight from crop seed. Manage weeds and prevent contamination, but if contaminated, remove in cleaning process. Extra work to remove weed seed in cleaning process. Must take extra care to ensure 100% of prohibited seed removed and noxious weed seed below allowable level. Not noxious or prohibited weed seed. Similar size and/or weight as crop seed. Manage weeds and prevent contamination, but if contaminated, remove in cleaning process. Extra work to remove weed seed in cleaning process, but not as critical as if noxious or prohibited. State noxious-weed seed requirements recognized in the administration of the Federal Seed Act [Online]. United States Department of Agriculture. Agricultural Marketing Service. Seed Regulatory and Testing Service. Available at: http://www.ams.usda.gov/AMSv1.0/getfile?dDocName=STELPRD3317318 (verified 11 Mar 2010). Mustard in mustards: guide to the identification of canola, mustard, rapeseed and related weeds [Online]. B. Callihan, J. Brennan, T. Miller, J. Brown, M. Moore. 2000. University of Idaho Extension. WREP 143. (Available online at: http://www.cals.uidaho.edu/edComm/detail.asp?IDnum=276) (verified 11 Mar 2010). PNW weed image collection [Online]. Pacific Northwest Weed Management Handbook. E. Peachey. Undated. Available at: http://pnwpest.org/pnw/weeds?weeds/id/index.html (verified 11 Mar 2010). Seed ID workshop [Online]. Ohio State Department of Horticulture and Crop Science. Undated. Available at: http://www.oardc.ohio-state.edu/seedid/all.asp?sort=common (verified 11 Mar 2010). Includes thumbnail photos of seeds by species. Useful for identifying contaminant seeds in your seedlot. Identification of weeds and other plants. ATTRA, National Sustainable Agriculture Information Service [Online]. http://attra.ncat.org (all verified 11 Mar 2010). Managing cover crops profitably [Online]. A. Clark (ed). 2007. 3rd Edition. Sustainable Agriculture Network (now SARE Outreach). Available at: http://sare.org/publications/covercrops.htm (verified 11 Mar 2010). Perennial weed biology and management [Online]. J. Colquhoun. 2001. EM 8776. Oregon State University Extension Service. Corvallis, OR. Available at:http://ir.library.oregonstate.edu/xmlui/bitstream/handle/1957/20172/em8776.pdf (verified 11 Mar 2010). This publication is updated each year and includes information on chemical and nonchemical management of weeds in many crops. This site offers the University of California’s official guidelines for pest-monitoring techniques and pesticide and nonpesticide alternatives for managing pests (including insects, mites, nematodes, weeds, and diseases) in agricultural crops including vegetables. The database is updated regularly as pesticide registrations change and new methods become available. New crops are added periodically. Materials are available as print documents and online. A series of fact sheets highlighting more than 60 specific weeds and their characteristics. These publications cover basic plant biology and offer both cultural and chemical control recommendations. See the “Weeds” section of the OSU Extension Publications and Videos catalog at http://extension.oregonstate.edu/catalog/details.php?sortnum=0184&name=W... (verified 11 Mar 2010). Agricultural weed management principles. C. Boerboom et al. 1993. WAEM 0167. Washington State University Cooperative Extension. 48 pp. Order from 509-335-2857 or 800-723-1763 or https://pubs.wsu.edu/ItemDetail.aspx?ProductID=14331 (verified 11 Mar 2010). Grower’s weed identification handbook. W. Fischer. 1998. University of California-Davis Cooperative Extension. Out of print. Managing cover crops profitably. A. Clark (ed). 2007. 3rd Edition. Sustainable Agriculture Network (now SARE Outreach). Available at: http://sare.org/publications/covercrops.htm (verified 11 Mar 2010). Steel in the field: a farmer's guide to weed management tools. Sustainable Agriculture Network (now SARE Outreach). Available at: http://sare.org/publications/weeds.htm (verified 11 Mar 2010). Weeds of the west. T.D. Whitson et al. 2000. Western Society of Weed Science. Available at: http://anrcatalog.ucdavis.edu/WeedsUnwantedPlants/3350.aspx (verified 11 Mar 2010).